The bright light from heaven provides top lighting from the right in this scene, whilst the yellow/orange flames of hell cast a warm glow onto the foreground figures. Notice the shadow of the cross of Jesus on the foreground rocks. You can see the source of the shadow in the last scene in this series (Luke 16 – Rich man & Lazarus – Scene 05 – Cross). The soul/spirit of Abraham in heaven, talking to the rich man across the great chasm, with Lazarus & one of the angels who carried him to heaven behind. This Blue version has a subtle blue overlay on the rocks & figures in the foreground, which is in contrast with the warm yellows & orange colours of the flames. There is also a white edge lighting on the figures, & on the foreground, which increases the contrast of the shadow of the cross. The white light comes from the cross of Jesus, which is behind the figures & unseen in this scene. This was a challenging scene to draw. 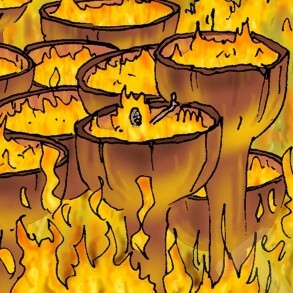 I had the idea of “cups” of fire arranged in tiers, in Hell, each one holding a person, quite a long time ago. This is the first time I have had a chance to illustrate that idea. It has taken me quite a long time to draw & colour this intricate scene. The great chasm mentioned in the above Bible verse is represented by the dark blue colours between the rocks in the foreground & the fires of Hell in the background. I like to maintain the skin, hair & clothing colours that I have established in previous cartoons, so as to maintain continuity between stories. 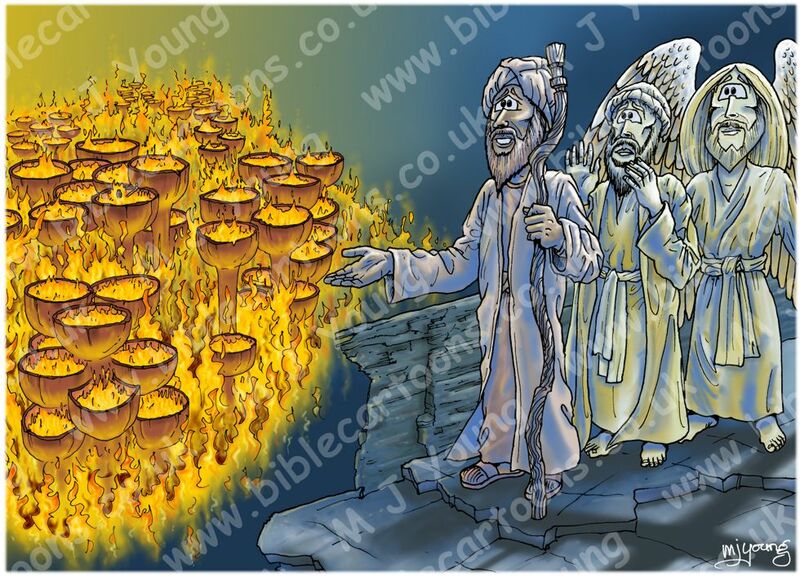 In this case, I had already established the colour of Abraham’s skin, hair & garments from an earlier Bible Cartoon (see Genesis 22 – Abraham & Isaac – Scene 03 – Sacrifice (version 01)). I have made these colours lighter, being in heaven now, than those of Abraham’s earthly life. The colours of the angel & Lazarus come from the previous cartoon in this series: Luke 16 – Rich man & Lazarus – Scene 03 – Angels. 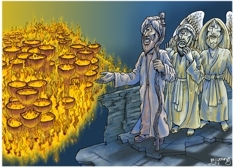 Luke 16 – Rich man & Lazarus – Scene 05 – Great chasm (Close-up of Rich man in fire “cup”).